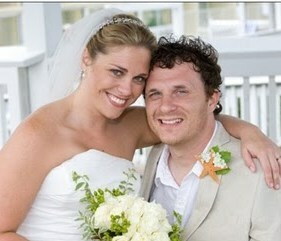 Two years ago, I married the man with the prettiest blue eyes I could find. He’s smart. He’s funny. He’s sweet. He’s handsome. And he gets me. He does all of this, from a wheelchair. When Michael was 17 years old he broke his neck in a gymnastics accident. He’s a C5/6 quadriplegic, paralyzed from the chest down, with limited use of his arms and hands. I am not sure just how much my perspective as a wife of a man with a spinal cord injury varies from the wife of any other man, because this is all I have ever known, but here goes. There is certainly a lot to get used to. Not everyone will agree with this assessment, but to me, as we were settling into that first year of marriage, it sort of felt like we had a third person along for the ride. That third person being my husband’s disability: the special needs it has, the equipment it requires, and the patience and effort required on my part to accommodate it. The catch was, unlike an actual person, the disability doesn’t communicate. You can’t reason with it. You can’t compromise. You can’t take turns. You just have to move out of the way when it is going a certain way. When it slows you down, you just have to slow down. When it goes haywire and changes your plans because of a bodily or equipment malfunction, you have to go with its flow. It doesn’t care if you are sick, or tired, or need a break. It must be handled first thing in the morning, last thing at night, and whenever it wants. It often cannot be “prioritized” or manipulated. This was a major adjustment, especially for a control freak like myself. Because with other situations in life, you can plan ahead, you can work harder, think faster, be smarter, and get your way. Being the wife of someone with a spinal cord injury can provide you with great perspective. Nothing like waking up every day next to someone who can’t move to make you realize whatever you are dreading or are afraid of that particular day, doesn’t really matter. But, if you’re not careful, that “perspective” can make you feel like you don’t matter. I learned, not so quickly, but eventually, to not take the third person “personally.” It took time. And lots of love from a husband who was not willing to let his disability swallow his wife. It is so cliché’, but communication really is key. Communication is key in any marriage, but in a marriage where a lot of the physical activity falls on one partner, because of a disability, communication is the glue that holds you together. Just as it is important for the able bodied, ”caregiving” spouse to make sure all of the needs of the disabled partner are met, it is important for the disabled spouse to make sure the caregiver is taken care of. There is so much support you can give, even if you have a spinal cord injury. My husband has found dozens of creative solutions to contribute. His legs may not work, but his ears do. He is an excellent listener. There have been times when I have felt third in line in this marriage, behind him and his disability. Because he was able to see me, and hear my perspective, he was able to change it. To make me realize that we are a TEAM. There’s nothing either of us did to deserve this. It’s not anyone’s fault. But neither one of us is in this alone. We are on the same team. Being part of a team is empowering. When you are weak, the other is strong. Two heads are better than one. Another cliché, but all of that is true. And when you’re dealing with a hard-headed non-compromising wildcard of a third person, you need as much power on your team as you can get. My husband and I write a candid blog about our life called “Love Like This Life.” We write about life, love, faith, work and disability. We put ourselves out there in the hope that we will connect with others and encourage them along the way. Come rock this out right along side us! Great article. I think that your insight is amazing. Keep up the good work. And had to live in hospital for 1 month in a half . Till death do us part!!! Living with the results of spinal cord injury is just about the most difficult thing I can imagine, mentally and physically. Those who survive and get on with their lives have every reason to be proud of themselves as they learn the true meaning of words like “love”, determination, perseverance, and accomplishment. I believe that when all is said and done, the experience actually enriches one’s life. I say this as a T4-5 “complete” paraplegic for 39 years, caused by a fall when I was 26 years old. I think it has helped me to look at all the difficulties as challenges to be overcome. However, everyone is different. I have sympathy, empathy, and the best wishes for everyone. I absolutely despise the phrasing “the new normal!” Nothing about living with spinal cord injury is normal! You actually need a prescription to take a pee. You can’t take more pees (get additional catheters) without getting a different prescription. You can’t go to parties because you can’t get into people’s houses. You can’t fly unless you can transfer. Traveling is a freaking nightmare! Normal? Not at all!! Well, its a good thing you are not paralyzed. You’d either give up or bail out of the life of whomever you know with a SCI. Spinal cord injury are common.Spinal cord injury results when a crack in the strong outer layer of cartilage allows some of the softer inner cartilage to squeeze out of the disk.Thanks for sharing information about spinal cord injury . We met when my husband was 24 and have been together 30 years, in May he fell from a ladder from our bedroom window he broke his neck (C1) but thankfully it didn’t kill him, he broke T4 and T5 and L11. He had head trauma and broke 8 ribs. He had blacked out whilst on the ladder and fell down. We are now 5 months along, the fact that he can’t walk and doesn’t have any control over his trunk is serious but what most people are not aware of his that he also doesn’t know when he needs to pass urine, empty his bowel, he is prone to skin sores as the skin becomes thiner, his blood pressure is constantly low and he is prone to infections. He has had one serious infection after the other (practically every other week recently) and is currently in intensive care because each time he gets an infection his heart rate spikes, his blood pressure drops and he has a high temperature and flu like symptoms. I love him more now than I have ever loved him, its not pity I cannot explain it but I love him so much I think it is because he has been so brave and strong and I love that. I am 100% supportive in his rehab and dearly want him to come home. However, The reality check is that our dream house that we bought, renovated together (carrying bricks and plaster out from the house, basically labouring) and spent all our savings on so that we could live our dream of a cottage in the country side, will not support his needs. He will be unable to have a shower or bath and will only be able to wash by the sink (he loves being clean), we are not sure if he can get from the bathroom to the front living room in his wheelchair as the passage is very narrow (he may have to go out the front door and then in the back door to get to the bathroom) and he will not be able to get upstairs because our cottage is quirky and the stairs are an awkward shape. We are having a constant battle getting support from the local Adult Care Services, even to get an Occupational Therapist let alone get any support for specialist equipment is a daily grind phoning them and emailing them to get support. The hospital he is in is good in many ways but in other ways not great, to lose weight he has been told each smaller portions! The food is poor and does not meet the needs of a Spinal Injury Patient. The hospital do not act quick enough when he gets infections and hence this is why the infections get really serious. Did you know that in the UK there is no quota that builders have to meet in regards to the provision of disabled housing, there is affordable housing but not disabled. Trying to move into a home specifically designed to assist a wheelchair disabled person does not exist, why not? We have a mortgage, he would love to go back to work when he is well enough but having to do bowel management in the morning, and catheterise himself during the working day will make it very difficult for him to work. I am four years away from retirement age. The crux of all of this is that our lives have been thrown upside down, our love will keep us strong but lets not sugar coat this, every day is challenging. Different societies have contacted us offering support but other than a volunteer visiting my husband I am not sure what they can do to help, to be honest. It could be that my head is always full of worry and anxiety and I am constantly running around trying to make things as good for my husband as I can that perhaps they can help and I can’t see it? My husband said he would have rather died than live as he is. He feels bad for others who are helping him daily. I reassure him again and again that we love him and will do anything and everything to help. I reassure him daily that I would rather have him as he is than not at all but it is not easy, it takes love, strength and positivity that maybe one day he may get feeling back again. Be safe, take care, wishing you all the very best. It is a private group – so nobody else will see what you’re discussing except those who are in the group.